Back in the spring our church had a goods and services auction as a fund raiser. A friend and I got together and offered a catered dinner for up to 6 people. Two couples teamed up and bid on it, winning the bid. The date chosen for the dinner was this past weekend. We had a lot of fun planning the menu, shopping, cooking and then serving the meal. This was so rewarding, and a great way to help out our church. 1. To prepare salsa, place all the salsa ingredients in a food processor, pulse 8 times. Set aside. If the bowl of your processor does not hold all the ingredients, divide in half and process in two batches, adding the lime juice and salt to the combined batches at the end. 2. To prepare shrimp, combine salt, sugar, cumin, chili powder, pepper, and shrimp in a large bowl or zip-lock bag. Toss gently to coat. Heat oil in a large nonstick skillet over medium-high heat. Add shrimp mixture; sauté 4 minutes or until shrimp are done. Serve with peach salsa. Couscous Salad with Grilled Squash and Feta. Sometimes I spend so much time doing something (like manicuring my own nails), that by the time it’s complete, I’m entirely disenchanted with the finished product. The same goes for some recipes. The longer I spend peeling, slicing, dicing, stirring, cooking and cooling, the less I want to eat it in the end. Sad story, right? Laundry is another example. Gathering, washing, drying, folding, ironing (really?, who irons?) and putting away….AAHHHH. Laundry is boring, not fun, not delicious! Oh, but this salad though….in and out. No exorbitant amount of time spent slicing and dicing. Just enough to get some veggies ready for the grill. Just enough time to boil water for couscous. Just enough time to put it all together with some tangy feta cheese and create a pretty salad. Let’s carry the bowl over to the table, pull out a chair, sit down and enjoy our efforts. This salad is the perfect balance of veggies, health and kitchen time. Let’s put some healthy salad in the mix! 2 Slice both kinds of squash lengthwise. Baste with olive oil and garlic. 3. Grill until tender, about 6 – 8 minutes per side. 4. Remove squash from grill and cut into bite-sized pieces. 5. In a large bowl, mix cooked couscous with squash and remaining ingredients. Garnish with feta. Serve warm or at room temperature. I have a cute new short haircut for the summer in preparation for the upcoming dance competition. I bought some bright pink lipstick and nail polish to go with my rhythm dress–the hot pink one with all the fringes on it. Ooh LaLa! My vacation is on hold until after the competition, then we are going SOUTH– in a good way. I hope you are on a vacation or going on one, sitting on a dock by a bay, or climbing every mountain. Have lots of laughs, super casual Fridays, and extra lazy Sundays. If you’re still at home ( like me), and if you’re in the kitchen ( also, like me), I wish for you fizzy beverages with lots of ice, and super delicious Summer Flavors. Here is a collection of some of my favorite summer-inspired recipes. What with Thanksgiving being so late this year, I’m rather behind in planning my holiday baking. This week I’ve been getting a mind set for the Christmas Holidays, ordering a few gifts, and am just now trying to sort out all those tempting recipes for baking up cookies and other goodies for gift-giving. It’s at this time of year that I can bake to my heart’s content and not feel guilty about who is going to eat it all. I’m giving most of it away!! Each year I struggle with choosing which treats will make the cut and be included in the packages I make for friends and family, and each year the choice becomes more difficult as I always find a couple new must-makes to include. For many of you Christmas cookies conjure up thoughts of rolled out gingerbread boys and girls, or brightly decorated trees. I like decorated cookies certainly, but with time having gotten away from me, my focus this year will be on great texture and superior flavor rather than cutting and piping. I’m also going to try and emphasize some of the popular flavors and get a diverse mixture going. While I sort this all out and come up with a few treats to share with you, here are some previous favorites that I will be considering when I finalize my list this week. Of all the incredible holiday cookies out there, in my opinion, nothing beats a great sugar cookie. These Anytime Sugar Cookies are simply delicious and are so adaptable to any kind of decorating; frost or not, sprinkles, colored sugars, etc. They are sure to please. Truffles are always a favorite of mine. These Funfetti Truffles are so easy to make, and you can vary the colors and flavors. When I’m baking so many large quantities of treats, I aways appreciate something that is simple to make but garners rave reviews every time. That would be these Salted Butterscotch Blondies. 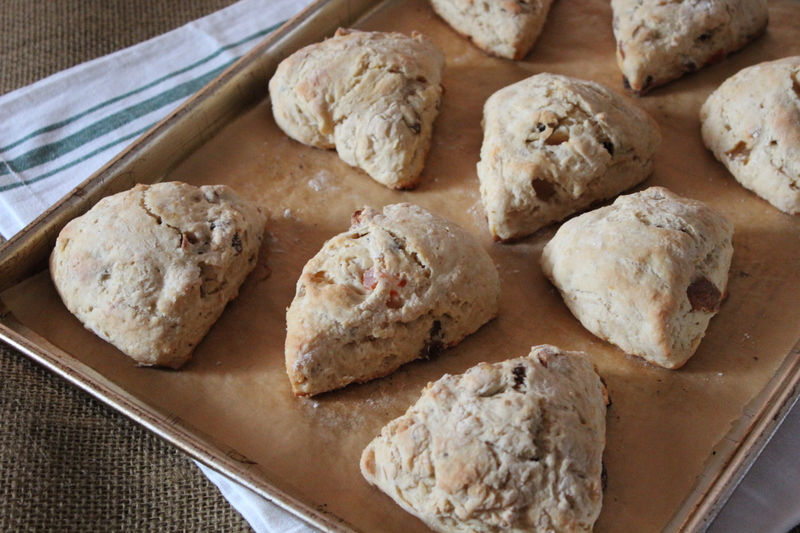 One batch makes a large panful and goes a long way. Last year I made these Chocolate Caramel Thumbprints and they totally wowed everyone. Sort of a pecan pie in cookie form. Some kind of biscotti are always included in my gift packages. These chocolate dipped Gingerbread Biscotti with crystalized ginger are my favorites, and everyone who has received them always loves them. These Red Velvet Crinkle Cookies, made from a cake mix, are so festive, they really add color to a cookie platter. They are so moist and chewy, always a popular addition to a box of treats. Maraschino cherries in a buttery shortbread cookie, dipped in white chocolate, with colored sprinkles decorating the edges. I made these Shortbread Cookies for the first time last year and they moved right to the top of my list of favorite cookies. They are pretty to look at, and the flavor is awesome. I know I’ll be making these again this year. Can’t wait!! The heat wave in the East continues. This is day #7, with at least one more day of it before some promised cooler weather makes its way here sometime over the weekend. The electric company is asking us to limit power usage during peak times, so I’m not using the stove or oven, and it’s too darn hot to stand outside over the grill cooking. What’s my solution to preparing meals? Well, since the refrigerator can’t be turned off, I am making use of it to the max and we are eating cold foods. Today, I went to the super market early in the morning to get some necessary items for my menu. You know, I actually Shivered while shopping in the frozen foods isle. Yikes, almost didn’t recognize what was happening! When I got home I did a little preliminary cooking (morning is not peak time for power usage. ), so that I could put together a cold salad plate for dinner. It turned into a Salad Niçoise, but I’ll save that for another day. Two foods that always suggest coolness to me are watermelon and cucumbers. Having purchased some of each of those foods, I was led to create a salad combining both of them. Chilled watermelon and chunks of cucumber tossed with feta cheese, fresh basil and a drizzle of balsamic dressing. I love that salty-sweet-tangy thing going on. It is guaranteed to keep you cool as a cucumber when the temperature outside will have you melting. I could be happy eating just this for lunch; it is so refreshing and cool. The second item I made using watermelon was Creamy Watermelon Pie. A pie so refreshing that it never lasts long on a hot summer day. Using just a few convenience foods, you can make it in a flash, then sit back and wait for it to thicken. Dee-lightful! In a large bowl, place the watermelon and cucumbers. Top with feta and mint or basil. When ready to serve, drizzle with the balsamic vinaigrette, and toss to combine. Pour filling into crust and chill for at least two hours. 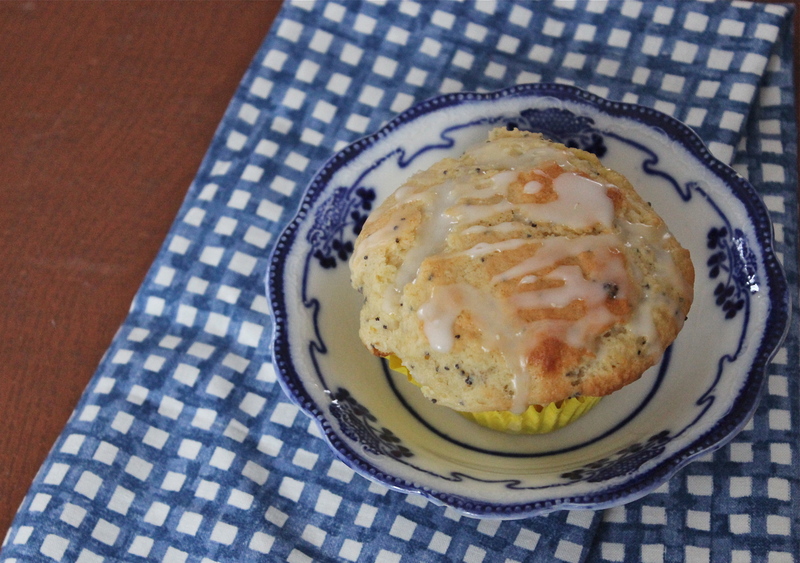 Lemon Poppyseed Muffins with lemon curd filling. Some muffins can be boring, especially if you’re used to making them from a boxed mix, and your choices are somewhat limited. If I’m putting in the time and effort to bake muffins then I want them to be special and worth the effort that went into making them. I can say that these little gems are way special and way good. I will even go so far as to say they are elevated to greatness by the addition of lemon curd baked in the middle of each one and fresh lemon zest in the batter and lemon juice in the icing. This is how I used some of the curd that I made and wrote about here. Is this extra work? Heck, no! I like to see the flecks of lemon zest in the dough and taste that deep lemon flavor in every bite. Most people would probably agree that muffins are a breakfast ( or brunch) food, but I say eat them anytime you heart desires. Think afternoon tea and a lemon muffin. Oh, yeah, they’re that good! 1. 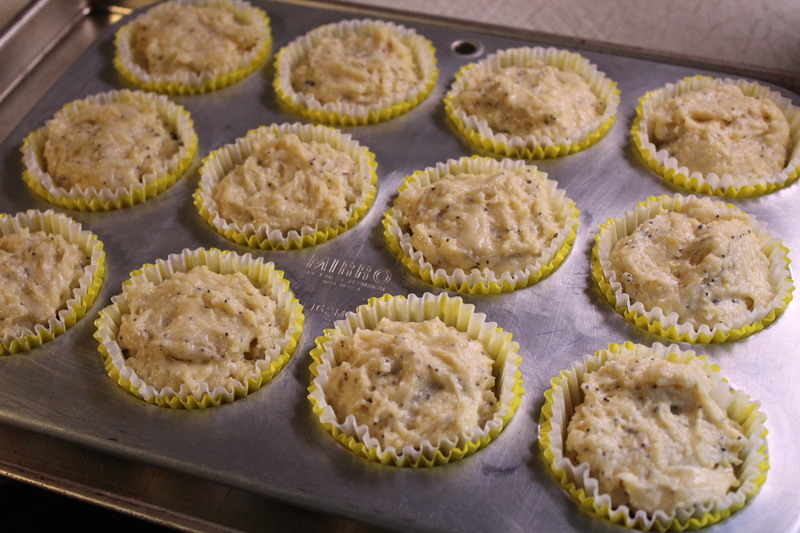 Preheat the oven to 400*F. Place paper muffin cups in a regular-sized muffin pan. Place muffin pan on a baking sheet. 2. In a large bowl, rub the sugar and lemon zest together with your fingers until the sugar is moist. Whisk in the flour, baking powder, baking soda, and salt. Thoroughly mix lemon zest with the sugar. 3. 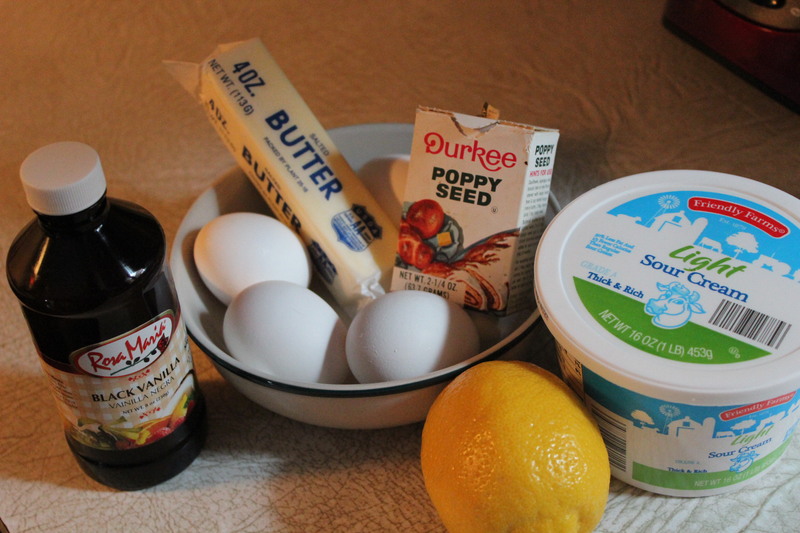 In another bowl, whisk the sour cream, eggs, vanilla, lemon juice and melted butter together until well blended. Pour the liquid ingredients over the dry ingredients and quickly stir to blend. (Be mindful not to over do it here) Stir in the poppy seeds. 4. 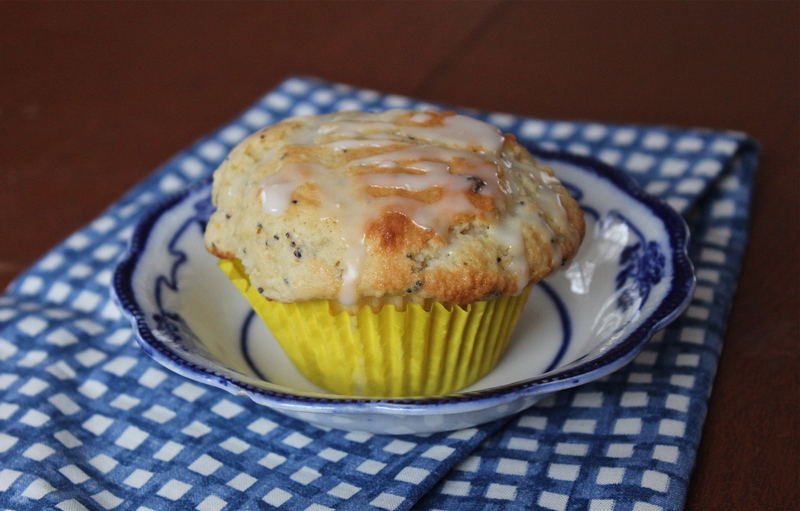 Fill muffin cups with half of the batter and put a teaspoon full of lemon curd in each one. 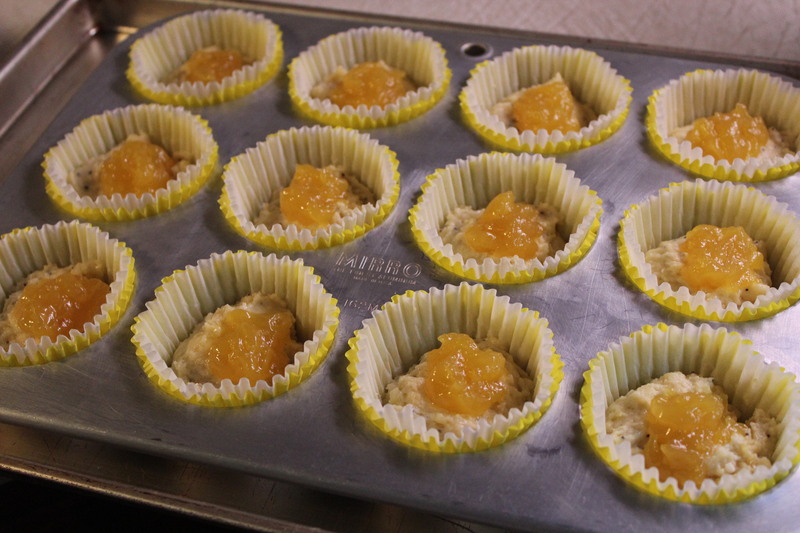 Place half the batter in muffins cups and add a teaspoon of lemon curd. 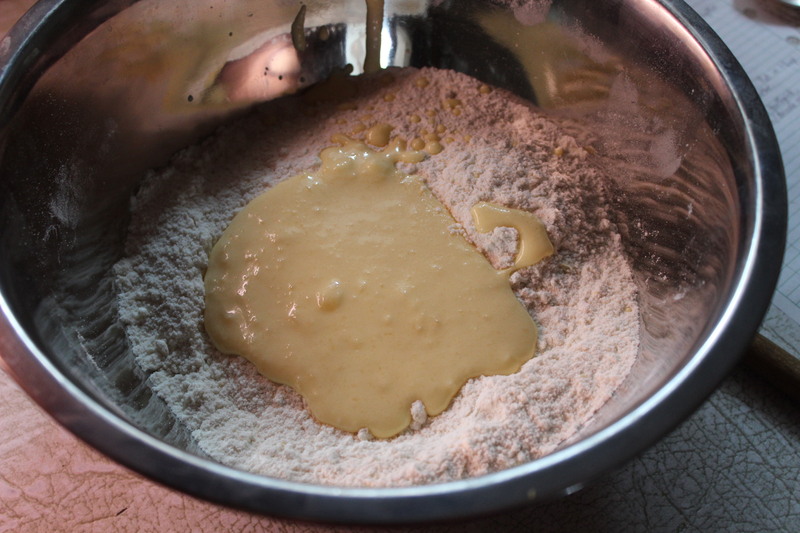 Fill in with the rest of the batter. Bake for 18 – 20 minutes or until the tops are golden and a toothpick inserted into the center of the muffins comes out clean. Cool muffins on a rack completely before icing them. 5. 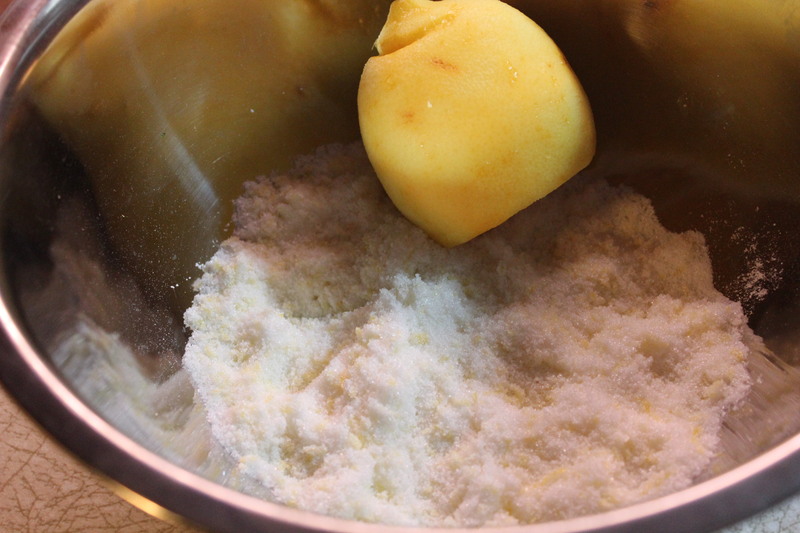 When the muffins have cooled, put the confectioners’ sugar in a bowl and add about 1 1/2 Tablespoons of the lemon juice. Stir together and keep adding small amounts of the juice until you get a drizzly consistency. 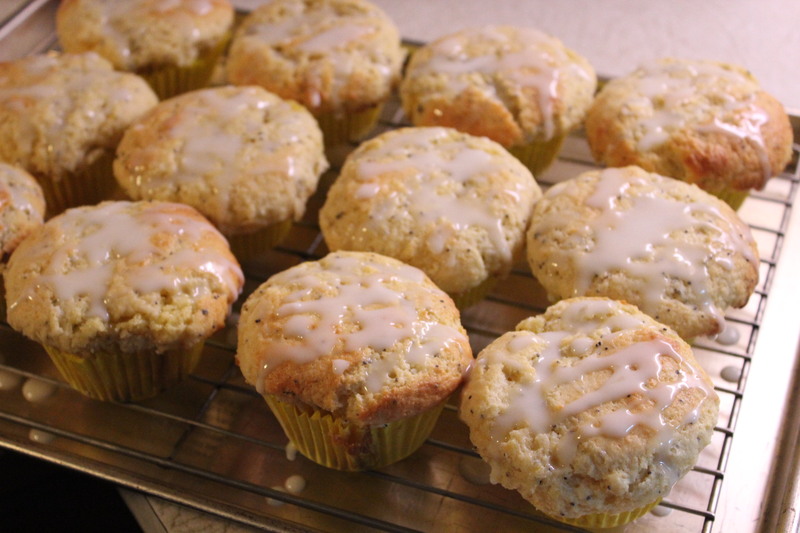 Use a spoon to drizzle icing over the tops of the muffins. 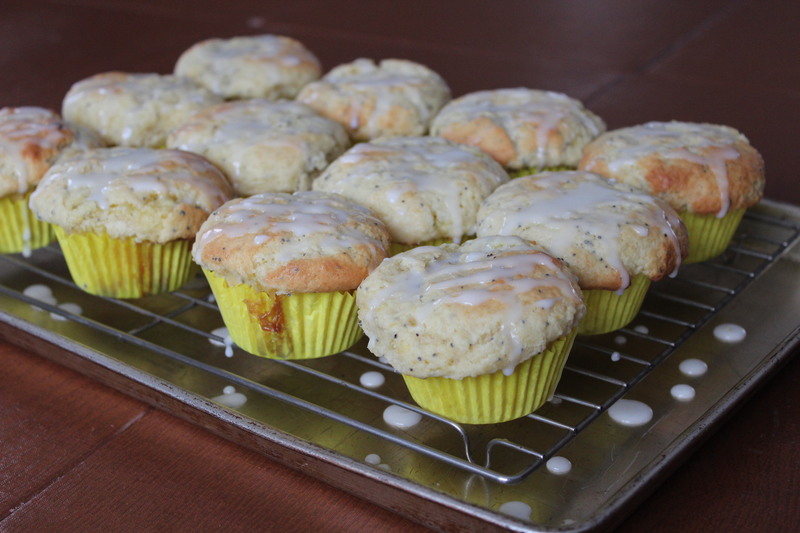 Drizzle lemon icing over cooled muffins. Just right with a cup of tea.